Martin Van Buren was a so-so president, but a talented politician. As the 2020 presidential election fires up, we are reminded again (and again) of how partisan our politics have become. The backbiting. The charges and counter-charges. The gridlock. But really, is it such a negative thing? To understand, consider that the father of our two-party system is the eighth president, Martin Van Buren (1782-1862). But how did he do it and why? Here’s the rundown, along with links and articles for further study. About Van Buren: Van Buren was brought up in New York's Dutch country. He was the first president born after Americans declared independence, and the only president to speak English as a second language—his family spoke Dutch at home. His father was a tavern keeper in Kinderhook, New York, and in those days, that meant he grew up immersed in politics. As a young man, Van Buren took a job in a law office and was subsequently admitted to the bar. He married his childhood sweetheart, Hannah Hoes, in 1807. The couple had five sons, one of whom died in infancy. Hannah died in 1819, before Van Buren became president. He never remarried, but gossip of the time linked him to the granddaughter of Thomas Jefferson, Ellen Randolph. When he was 60, he proposed to—and was rejected by—Margaret Sylvester, daughter of a lawyer under whom Van Buren had studied law, according to The Complete Book of Presidents, by William A. DeGregorio and Sandra Lee Stuart, (Barricade Books; 2013). Entry into politics: A believer in states’ rights and limited government, Van Buren built the Albany Regency, an informal New York political organization that became an effective force. “He shrewdly dispensed public offices and bounty in a fashion calculated to bring votes. Yet he faithfully fulfilled official duties,” according to the White House.gov website. In 1821, he was elected to the U.S. Senate. Seven years later, he ran for governor of New York and won. But after three months, he resigned in March 1829 to become Democrat President Andrew Jackson’s secretary of state. In Jackson’s second term, Van Buren became vice president. He served as president from 1837 to 1841. In Van Buren's view, political conflict was inevitable. "The trick, though, was to manage this conflict," writes Silbey. "Thus, the importance of his crowning achievement—the Democratic Party—which Van Buren hoped could control this intra-party conflict in order to defeat its opponents." Impact: “What emerged from Van Buren’s vision was the two-party system: initially, Jacksonian Democrats versus Whigs, then eventually, Democrats versus Republicans,” writes Mark Cheathem professor of history at Cumberland University, in an article for the Tennessean. Bottom line: You would be forgiven for not knowing much about Van Buren. He does not have the star power of George Washington, Abraham Lincoln, Theodore or Franklin Roosevelt. Soon after he became president, an economic depression swept the country, and Van Buren was called Martin Van Ruin. He was also famously noncommittal. When asked whether Congress had the power to abolish slavery in the nation's capital, Van Buren issued a statement conceding that Congress had the authority, "but he then quickly added that he personally opposed abolition and pledged to resist interference with slavery in the South," recounts The Complete Book of Presidents. After serving one term, Van Buren was defeated by William Henry Harrison. When ranking presidents, historians put Van Buren in the middle—a C student, of sorts. But when they write about him, they write about his contribution to the party system. And yes, sometimes, the two-party system appears to be a disaster, but it works. Encyclopedia Britannica: Martin Van Buren. Martin Van Buren, the American Presidents series, by Ted Widmer (Times Books; 2004). Miller Center, University of Virginia: Martin Van Buren -- Impact and Legacy by Joel Silbey. National Constitution Center: Martin Van Buren's legacy -- Expert politician, mediocre president by Scott Bomboy. National Portrait Gallery: America's Presidents -- Martin Van Buren. National Park Service: Martin Van Buren. White House.gov: Martin Van Buren. 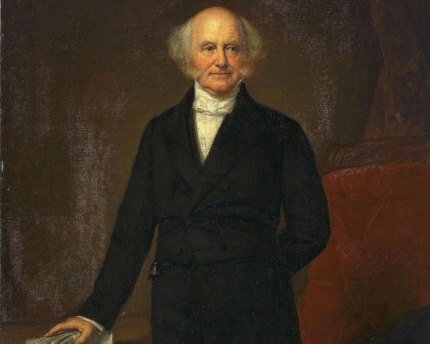 Tennessean.com: How Martin Van Buren created the two-party system by Mark Cheathem. The Complete Book of Presidents, by William A. DeGregorio and Sandra Lee Stuart, (Barricade Books; 2013).